I don’t do well at brackets. I have enough sense to stay away from the NCAA basketball bracket madness. I do torture myself though playing the NHL Stanley Cup bracket challenge. This year was particularly bad. I know the playoffs aren’t over yet, but with the finals matchup decided, I can talk about the implosion of my bracket, which is pictured below as it stands after the conference finals. Things got bad right off in the first round. Looking at the East, only the Penguins made it through. Ottawa, given their season, seemed a good bet over Montreal. I was confident the Capitals would knockout the Rangers and that was a huge disappointment because a Rangers fan I am not. Toronto did almost take out Boston, but Boston alluded that fate and the team would go on to do even more damage to my bracket later. I fared better in the West. The Blackhawks continued their excellent season and wiped out the Wild. Despite just squeaking into the playoffs, the Red Wings took care of the Ducks. L.A. dispatched St. Louis. However, I still don’t quite understand how Vancouver didn’t get past San Jose. Of course, with such a bad first round, my second round was pretty screwed. In the East, I was still on track since Pittsburgh did move into the conference finals. For the West, predicating that Chicago would defeat Detroit was a difficult thing to enter into the bracket, but it seemed the right choice. In the days where it looked like Detroit might actually take the series I was thrilled and didn’t care that my bracket was going to get further pummeled. In fact, I would’ve preferred the bracket damage to the painful way Detroit ultimately exited. And, since I predicted Vancouver to take out L.A., my second round picks were further laid waste. And then came the conference finals. As much as I love the Penguins, they certainly deserved to be swept given the mistake-laden play they displayed against Boston. At least Chicago persevered and I do have a bracket choice in the finals. 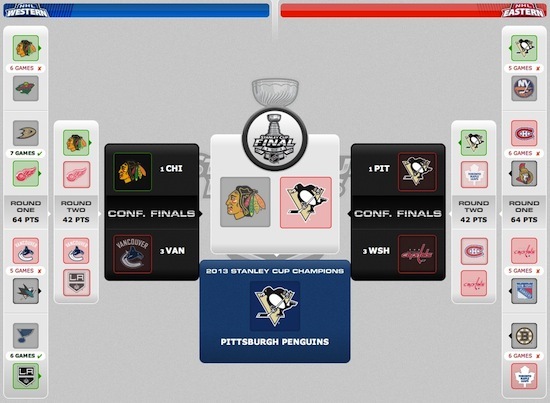 Of course, I do have that big Penguins logo sitting in the “Championship” position and now that’s very wrong. I am excited about the Blackhawks/Bruins series. The way these two teams played in the conference finals was great to watch and I envision many overtime games and a seven-game series. Certainly the triple OT of game 1 makes this prediction seem all the more correct. The playoffs, despite the bracket trauma, managed to do what I was hoping for: getting me reengaged in NHL hockey. I’m already looking forward to the fall when everything starts over. My hope for the summer is that the Red Wings learn from the issues that cost them a 3-1 series lead against Chicago and that the Penguins sort out the disaster that was the Boston sweep. This entry was posted in Detroit Red Wings, Playoffs and tagged nhl stanley cup, Stanley Cup Playoffs. Bookmark the permalink.